Want to rate this comment? Why not? You will see that ratings that have been made in threaded (nested) comment-ratings will internally be summed up to their parents. This means that a parent comment can have lower ratings but because it’s child comment-ratings the comment will appear on the top. This is a depth 1 comment. This is a depth 2 comment. This is a depth 3 comment. This is again a depth 1 comment. Or: just write your own comment down below! Or bring this comment up by rating it positive! Nice plugin but the ratings (stars) option at the bottom of comment form seem unecessary. Nice plugin! Might even consider buying it! Please be so kind and drop me a line by mail. We have some glitches with installation. Just bought it on CC. Hey Boris, please use my support form if you have any issues with the plugin. Thanks. Quick question: Any way to display the top comments in a widget? Yes, you can use the shortcode in a WordPress Text widget ;) See FAQ question 6. Would it be possible to remove the thumbs down? We want to give people the ability to vote up good comments but down-voting has the potential to turn nasty. Our users are not very savvy and many of them would not realize they should click unless we tell them! This hides the thumbs-down button via CSS. 1. Is there an option to only have up votes? 2. I would only want the ratings to show on certain post types. Possible? 1. Yes via CSS. Please see the FAQ page for more. 2. No. That’s currently not possible. But you can add a feature request. The ‘buy now’ link is going to a png file. Here you said that its 18$ Unlimited Websites, but when going to codecanyon, i see there is extended license or single license that says its not for Unlimited Websites but for only one site. An option would be nice, that comments with -10 or more are fading out or are hiding. Just seeing how this works. I am really looking for a ranking system for users based on their number of comments and rating of their comments. This would give them a rank and a special icon of their actual rank would be displayed. Sort of like forum rankings but instead for comments on WordPress sites. Does anything like this exist? not a bad idea. Maybe this is something for my feature list. Looks great ! – Made good job! 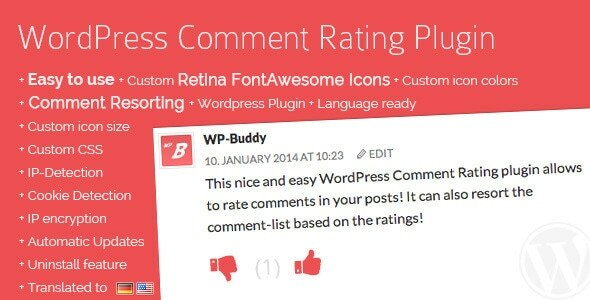 This is One of the best plugin we have for WordPress because rating comment and bringing it up first is great thing and i do suggest you all to use this as well. Is your plugin compatible with WP version 4.6.1? Hey there. It’s always compatible with the latest version of WordPress. So at the moment this is 4.7.4.